Joanne Billingsley, a former Texas regional Teacher of the Year, is a consultant, author, keynote speaker, and nationally-acclaimed lecturer for the Bureau of Education & Research and the Greenleaf Brain Institute. After a twenty year career as a science classroom teacher, she founded Billingsley Education. Joanne is renowned for delivering seminars that help teachers create brain-friendly, language-rich, interactive classrooms. Her mission is to develop and share powerful learning strategies, processes, and products that bring out the best in teachers and students. Her groundbreaking book, Aim to Grow Your Brain: The Secret Mindset of Underachieving Students & Five Steps to Inspiring Greater Effort was released in October 2009. Her newest book release 2013 is titled - 6 Steps to Building Academic Vocabulary - Using Card Sorts & Vocabulary Trailers in the Classroom. Significant language discrepancies exist between children of low-income households, English language learners and children of higher-income families . These gaps in the quality and quantity of vocabulary clearly impede student academic success. Using high-quality instructional strategies, teachers can create an enriched learning experience and accelerate vocabulary development in students with language deficiencies. 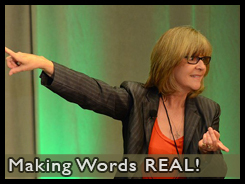 Come explore neuroscience based strategies that provide intentional opportunities for language interaction. Learn how to turn mundane vocabulary lessons into a multi-sensory interactive experience, where students hear, see, feel and speak using new vocabulary. Tap into the power of music and imagery to enhance vocabulary recall and reading comprehension. Engage students with card sorts, content trailers, vocabulary-in-a-bag and sentence puzzlers, all powerful tools to give students the gift of academic language! This seminar will guide educators in the use of high-quality neuroscience based instructional strategies. The goal is to accelerate vocabulary development for all students, including students with language and literacy deficiencies. One of the oldest findings in educational research is the strong relationship between vocabulary knowledge and reading comprehension. Research indicates that the intentional, explicit teaching of specific words can enhance both the quantity and quality of students’ vocabularies resulting in improved reading comprehension, listening skills, and literacy. opportunities to work in and develop small learning communities, where students offer and receive support from one another. a dramatic increase in student-to-student opportunities for listening, speaking,, reading, and writing in small groups. the availability of color illustrations and teaching diagrams that support student understanding and retention of new words. structured opportunities to relate to new words and to discuss prior knowledge/life experiences within a small group. the availability of sentence stems to support speaking and writing in complete sentences. encouragement and support in taking academic risks as well as giving and listening to different points-of-view. the availability of immediate feedback followed by an opportunity for self-correction. continued opportunities for students to play word games and to use new words in extension activities. Note: This is a 3-6 hour seminar designed for 25-150 participants. It is highly interactive, fast-paced and packed with powerful ideas and strategies. Attendee leave this seminar, highly motivated and excited to implement the new strategies they acquire. Joanne's seminar offered information and strategies that can be implemented immediately in the classroom . It is the best workshop I have had the opportunity to attend in 30 plus years of teaching. Joanne was a breath of fresh air… witty, energetic, interesting. The seminar content was relevant, research based, practical, and doable. Each year we begin the academic year with a large kick-off training and all secondary teachers are invited to attend. This year we were fortunate to have Joanne Billingsley. Our district has a population of 34,000+ and 55% of the population are or have been English language learners. During this training she opened teachers eyes to see how they can unleash ELL students’ potential and gave the teachers strategies to make their content more comprehensible for these students. Joanne Billingsley’s training “hit a homerun” with the teachers. She modeled powerful researched-based strategies that accelerate the understanding and retention of academic vocabulary. She was engaging, informative, interactive and the teachers are still talking about her training as we continue to meet with them this year.